Contact us at (704)542-6254 to set up an appointment to have us look at your computer. "I figured everything was lost when my laptop crashed - a month's work out the window! A friend of mine told me to bring it to J&J Computer Services Inc., so I did. In less than two days, they were able to retrieve all the files. Absolutely saved me." 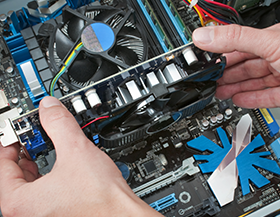 Our technicians have an extensive IT background and can handle nearly any computer issue. Whether your computer has a virus, has a data access issue, or just needs new hardware installed, we can get it up and running quickly so you can get back to work or play. We understand how important your computer is to you, so you can trust us to have it back to you directly. J&J Computer Services Inc. is your home for complete computer repairs, maintenance, and upgrades. Conveniently located at 6515 Porterfield Rd. in Charlotte, we do our best to minimize the inconvenience that a malfunctioning or distressed computer causes. You can trust us to be honest and upfront, providing you with exceptional computer services at a fair price.